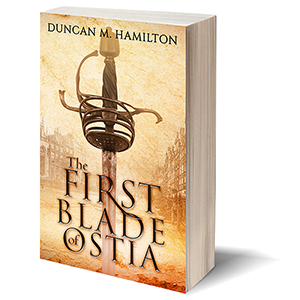 Win a paperback copy of The First Blade of Ostia! Feel free to share the link around, and good luck to everyone who enters! The Goodreads giveaway for 2 signed copies of The Tattered Banner is now live and can be found by clicking on the image above or here. It runs for one week and is available worldwide. The Tattered Banner is now also available for Kindle on Amazon, in the US, the UK, Canada, Japan and other international Amazon sites. There are two copies of The Tattered Banner available to be won in a giveaway over on Goodreads, which can be found here. I’ll even break with my usual policy of never marking a book and sign them for the winners, if they so desire! In other news, the Kindle edition is still in the works, and should be available by the end of the month.